THEY'RE BACK! Basil, Sybil, and Manuel return to serve up more madcap mayhem, dinner, and a feast of comic delights - some familiar, some off the cuff - but guaranteed to keep diners laughing all the way to dessert. Faulty Towers: The Dining Experience makes a welcome return to the Vodafone Comedy Carnival Galway on Friday October 27, Saturday 28, and Sunday 29 in the Galway Bay Hotel, Salthill. 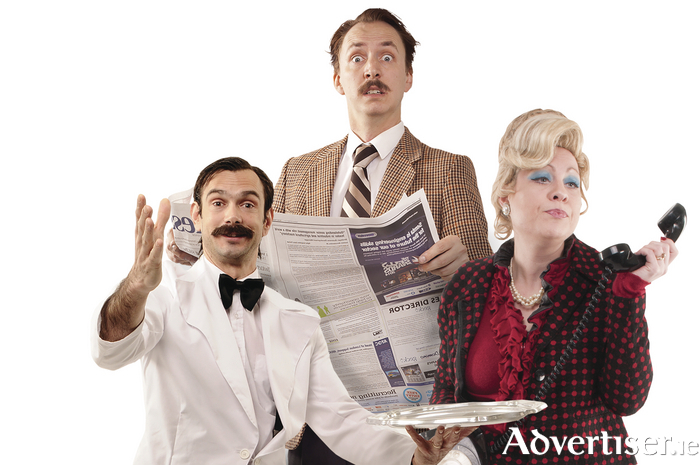 Basil is manic, Sybil domineering, and Manuel – of course – is hopelessly language-challenged. Everything that can go wrong does in some beautifully controlled chaos. Just don’t mention the war! Described as "hilariously bonkers!" by the Edinburgh Evening News and an “eat, drink and laugh sensation” by The Daily Telegraph, this multi-award winning show has been winning fans and accolades at the Edinburgh, Melbourne, and Adelaide festivals for years and has enjoyed more than 500 sell out shows in Ireland since 2009. Featuring all the best gags from the much-loved TV series Fawlty Towers, and a three course meal, this is the loosely scripted, pitch-perfect ‘13th episode’. Tickets are €48, including the show and three course meal. Tickets are available from vodafonecomedycarnival.com and [email protected] Zhivago, Shop Street (091 - 509960 ).